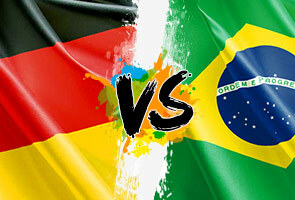 What are the chances in the upcoming match between Brazil and Germany? Early Wednesday morning in Malaysia, we will witness whether what arguably, is this Galaxy’s most popular team – Brazil – will advance, and maybe meet Argentina in the Finale Das Coupe Mundial de Football. Sorry I took the liberty of conjuring this veritable mish-mash from the truly international pot of nationalities from the potpourri of 64 countries that began the footballing journey almost three weeks ago. This has been a breathtaking World Cup – indeed; a Cup where the on-field action has simply taken the breath away. Thank the host Brazil for that. They set the ball rolling by securing a convincing win in its opening tie against Croatia scoring three goals in the process and then going on to bang in four goals in its third game. A dull draw sandwiched in between was quickly forgiven. It went through a heart-stopping moment at the start of the win-to-stay-in, lose-and-you-leave stage, having to win a penalty decider before scoring a convincing 2 – 1 victory against a South American neighbour to get this far. Being in the semi-final of a World Cup is almost a God-given right if you are Brazilian. The organisers, least of all FIFA, must have been having sleepless nights right up to the very last moment leading up to the opening whistle. All the world’s media went to town as they latched on the issue of unfinished stadia and economic returns – or the perceived lack of. Such concerns were the spur that became the rallying point for scores of its citizens turning up in protest rallies in the days leading up to the opening ceremony. But their voices now appear to be muted and their presence missed – they appear to have vanished into thin air! Maybe their ire were dampened and their fire doused with each Brazil victory. No one wants to rain on the nation’s biggest party, if they do actually get to the play in the final in the Maracanna, that cathedral of football. What’s more, the Brazil soccer team has the best chance in many of its citizen’s lifetime, to see their team win the trophy for the sixth time – and the first time ever, on home soil. The German coach Joachim Low has dismissively said Brazil will not prevail against his charges. Throwing the first verbal assault, he nonchalantly said this team lacked flair. Now, he may be right. How can anyone hold a candle to the Samba boys of the past – the likes of Jairzinho, Socrates, Zagalo and of course, the incomparable Pele? But even with a Neymarless attack line, Brazil is not exactly toothless. A voodoo exponent who goes by the name of Heliosilman has offered to break every German players’ legs – ha ha, I am just pulling your leg. The witch doctor has offered to cast a spell on at least one German player who, if his spell works, will cry off injured just before the two teams meet. Germany are not exactly paupers in the Trophy cabinet department. Brazil may have 5 trophys, Germany is not too far behind with three World Cup titles under their belt. So what’s this about a broken bridge? Just a few days ago, a bridge overpass under construction collapsed on to a existing road in Belo Horizonte some three miles from the Mineiro stadium. Two people were killed and 19 injured. This accident was an incident that was just waiting to happen. The Brazilians may be masters at football but somehow, their engineers who were supposed to be getting all the infrastructure up could not do it in time; for some of it to be ready for the World Cup. Perhaps, when they do lift the trophy on July 14, even the victims will forgive them and join in the mother of all celebrations.